South Carolina's thriving cultural center of Charleston, and the luxurious coastal island resorts belie the state's turbulent history. Raging against British taxation, South Carolina sent delegates to the Continental Congresses of 1774 and 1775. Throughout the Revolutionary War, the state fought and suffered through 137 battles on her soil. When the British were quashed at the Battle of King's Mountain in 1780, the tides were turned. The almost legendary figure Francis Marion (the Swamp Fox), also contributed to the British retreat. Marion and his men would hide in the swamps and strike out in surprise at British troops, only to vanish again into the unwelcoming swampland. British forces finally withdrew from Charleston in 1782. In 1861, when Fort Sumter in Charleston Harbor was fired upon, the Civil War began, and South Carolina was again engaged in war. Today, the coastal region thrives as tourists and residents enjoy the splendor of the sandy beaches and islands, and Charleston serves as the state's impressive cultural center. For 475 years of South Carolina History, purchase Walter B. Edgar's " South Carolina: A History . Edgar uses letters and diaries to help share, in human terms, the story of this illustrious state. This nickname refers to South Carolina's official State Tree, the Sabal Palmetto. The Palmetto is rooted in historical significance dating back to the Revolutionary War. On June 28, 1776, the British fleet's attack on Sullivan's Island was repulsed. The palmetto-log fort, under Colonel William Moultrie, withstood the barrage of British cannons until the fleet retreated. The Sabal Palmetto (Inodes Palmetto), commonly referred to as the Cabbage Palmetto, was added to the National flag of South Carolina, after it seceded from the Union in 1861. The Palmetto is South Carolina's official State Tree. It also appears on the South Carolina State Seal and in the salute to the flag of South Carolina written in 1950 by Mrs. John Raymond Carson and adopted by the General Assembly in 1966: "I salute the flag of South Carolina and pledge to the Palmetto State love, loyalty and faith." The production of rice in South Carolina led to this nickname for the state. South Carolina is known for the swamps and marshy areas where rice is grown. South Carolina's wedge shape is the basis for the "Keystone of the South Atlantic Seaboard." South Carolina has been referred to as "The Iodine State" because of the large percentages of iodine found in the vegetation growing in the state. This derogatory name probably referred to the poorer residents of the state living on the sandy ridges where scrubby pine forests grew. It was said, in jest, that they lapped up sand to stay alive. People who live in South Carolina or who come from South Carolina are called South Carolinians. The South Carolina quarter design was officially unveiled in a ceremony in Columbia, South Carolina on May 26, 2000. This quarter was the eighth released in the 50 State Quarters series and the third released in 2000. The design of the quarter highlights the South Carolina State Bird, the Carolina Wren, and the South Carolina State Tree, the Sabal Palmetto. Commonly called the Cabbage Palmento, this tree also lends itself to the nickname of South Carolina, The Palmetto State. 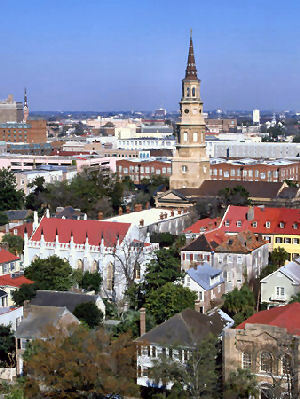 Its significance dates back to the Revolutionary war, where it played an integral part in the protection of Charleston Harbor from the attacking British fleet. In addition to the State Bird and the State Tree, the design highlights the state's nickname and the date that South Carolina, one of the original 13 colonies, joined the Union. 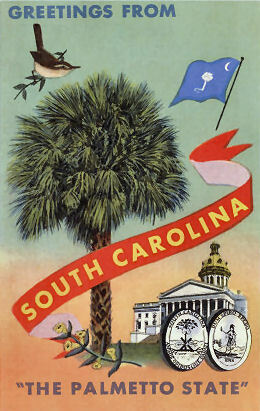 All of the elements are backed by an outline of the state with a star representing South Carolina's capital, Columbia. South Carolina (From Sea to Shining Sea) , by Myra S. Weatherly. 80 pages. Publisher: Scholastic Library Publishing (March 2002) Reading level: Grades 3-5. Presents information about South Carolina's people, geography, history, landmarks, natural resources, government, state capitol, towns and cities, and more. South Carolina (World Almanac Library of the States) , by Ann Volkwein. 48 pages. Gareth Stevens Publishing (October 2002) Reading level: Grades 4-6. Filled with the most up-to-date information, including the latest Census results. Full-color photos bring to life the story of South Carolina. In addition to an in-depth factual profile of South Carolina in the form of a state Almanac, this book offers fascinating and lively discussions of the state's history, people, geography, government, economy, culture, and lifestyles. A section on Notable People, a calendar of events, and enough primary source documents, time lines, maps, and other tools to make this unquestionably the best young adult reference material on the USA available anywhere. The South Carolina Encyclopedia , edited by Walter Edgar. 1120 pages. Publisher: University of South Carolina Press; illustrated edition edition (September 18, 2006) The South Carolina Encyclopedia is a comprehensive single-volume reference for just about anything anyone would want to know about the Palmetto State's rich cultures and storied heritage, from prehistory to the present day. The encyclopedia is the result of a six-year collaboration between the Humanities Council SC, the Institute for Southern Studies at the University of South Carolina, and the University of South Carolina Press. Under the editorial direction of distinguished historian Walter Edgar, five hundred ninety-eight contributors have come together to write more than one million words depicting the representative people, places, and things that define South Carolina. The encyclopedia is an authoritative, entertaining compilation of essays on a broad array of topics ranging from war and politics to arts and recreation, from agriculture and industry to popular culture and ethnicity. Among the nearly two thousand entries are such diverse subjects as the Boykin spaniel, John C. Calhoun, Sarah Moore Grimké, Hootie and the Blowfish, Indian mounds, Matthew J. Perry, Rainbow Row, Surfside Beach, and white lightning. The palmetto bug, Lizard Man, and okra are all here, as are hurricanes, the Orangeburg Massacre, and yellow fever. Included as well are essays on every South Carolina county, every town with a population of twenty-five hundred or greater, and all elected governors and U.S. senators from the state. Famous figures and infamous characters, historic events and tragic moments, celebrated creatures and provocative lore, staple crops and new industries, the encyclopedia catalogs all of this and much more. South Carolina: A History , by Walter Edgar. 716 pages. Publisher: University of South Carolina Press (September 1998) Walter Edgar presents a sweeping chronicle of a state with an illustrious, sometimes infamous, past. He describes in very human terms 475 years of recorded history in the Palmetto State, including the experiences of all South Carolinians-those with roots in Africa and in Europe as well as Native Americans; male and female; rich and poor. In an eminently readable presentation, Edgar uses letters, diaries, and other writings to let voices from the past take part in telling the state's fascinating story. Recounting the period from the first Spanish exploration to the end of the Civil War, Edgar charts South Carolina's rising national and international prominence and its parallel economic ascendancy. He dispels myths about the state's early history--including the notion that the colony was inhabited by a homogeneous white population--and tells how South Carolina developed an agricultural economy that relied heavily on African American slave labor. Edgar examines, among other topics, the impact of the American revolution, Charleston's significance as a metropolis and major seaport, and the state's leadership in the Secession movement. South Carolina: An Illustrated History of the Palmetto State , by Ernest McPherson Lander, Jr. and Archie Vernon Huff, Jr. 256 pages. Publisher: American Historical Press (October 30, 2007) An elaborate and detailed account of the nations eighth state, tracing its history from the Indians and first European settlers to the dramatic events that lead to the Revolutionary era, the Civil War years and challenges of the 20th century. Its all herethe politics, culture and economic forces as well as the contributions of notable persons and events that helped shape the South Carolina of today.